100 aircraft in 9 years, time flies: When Emirates, the world’s largest international airline, takes delivery of its 100th flagship Airbus A380 this autumn, it will be a premiere in the aviation industry. With a fleet consisting of 260 wide-body aircraft, Emirates is the world’s largest A380 and Boeing 777 operator. On the occasion of this milestone delivery, Emirates now introduces special fares for globetrotters travelling in Business and Economy to a variety of destinations in its global route network for bookings made before September 13th, 2017. Emirates has started operating the Airbus A380, the world’s largest passenger aircraft, on the daily route Prague-Dubai on May 1, 2016. In addition to the renowned service, Czech travelers can enjoy hassle free travel to more than 150 destinations around the world with a single interchange at the central junction – Dubai. In addition to popular Dubai, Czech travelers can fly with this magnificent aircraft to other destinations such as Bangkok, Hong Kong, Taipei or Mauritius with a single transfer. Customers on all Emirates’ flights are welcomed and served by multi-national cabin crew and enjoy gourmet cuisine, fine wines and Premium beverages together with Emirates’ award-winning ice entertainment system. With more than 2,500 channels of on-demand entertainment, from movies, television programmes, games, audio books, and music from around the world, ice has been named the world’s best inflight entertainment system by Skytrax for 13 consecutive years. Passengers traveling in First and Business on Emirates’ iconic aircraft can enjoy the A380 Onboard Lounge, a popular meeting point in the cabin, where customers can indulge in gourmet canapés, exclusive wines and spirits from all around the world as well as individually-made cocktails. Earlier this year, Emirates announced a brand new design concept for the onboard lounge, modelled on the style of luxurious yachts. The first Emirates A380 featuring the newly designed onboard lounge took to the skies in July 2017. Emirates’ special fares are available to be booked only between September 4th and September 13th so early booking is advised. Offers are valid for travels between September 15th and December 7th 2017. The offer for business class consists of companion tariffs, in which at least 2 adults have to travel together on all segments of the journey. All prices are for return flights in Business or Economy per person and include all charges and fees. The special fares are subject to availability and individual terms and conditions apply. 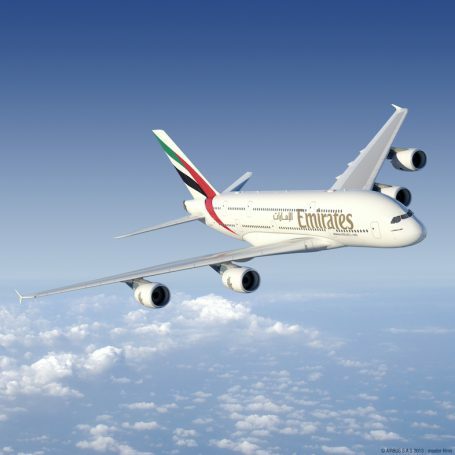 Flights can be booked online at www.emirates.com, by phone at 00420 239 016 320 or through travel agents. Travel agents may charge different service charges.